There’s something about Mars. It tickles the imagination like no other planet; in our stories about it, fact and fiction tend to blur. Nineteenth-century astronomers believed they saw canals on Mars, proof of intelligent life. In 1938, an Orson Welles radio play convinced some listeners that a Martian invasion had kicked off a war of the worlds. 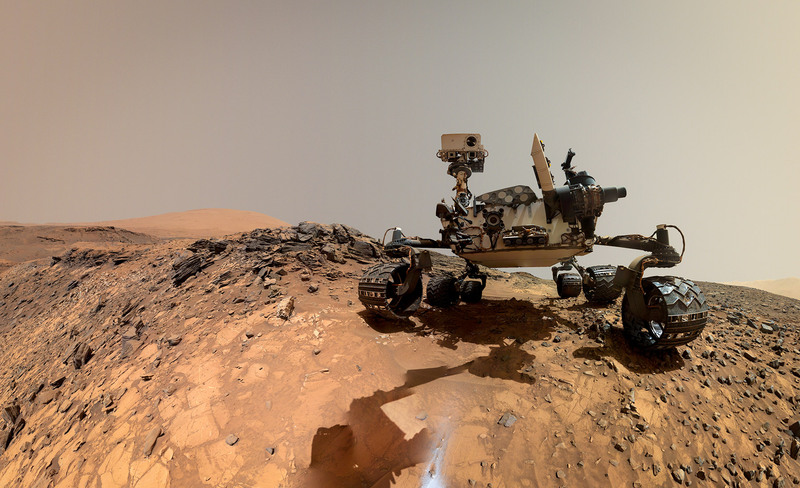 NASA and its robots feed us tantalizing tidbits suggesting liquid water in some distant past, and the public runs with it: In 1999, 35 percent of respondents told Gallup they believe there’s currently life on Mars. And now, a billionaire intends to settle the red planet within a decade. On February 6, Elon Musk’s SpaceX corporation blasted a Tesla Roadster into orbit, a test of the Falcon Heavy rocket—the most powerful on the market. 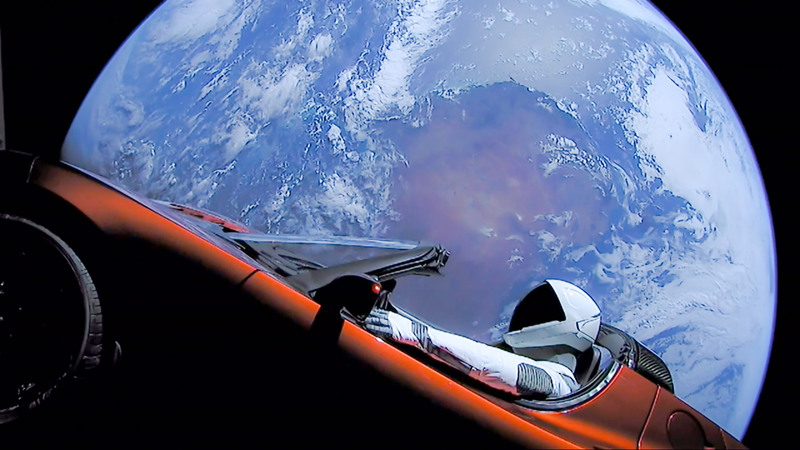 The launch became the second-most livestreamed video in YouTube history, and the rocket’s success—alongside Musk’s subsequent publicity tour—set off renewed excitement about space travel. But not all on the Left are anti-space. 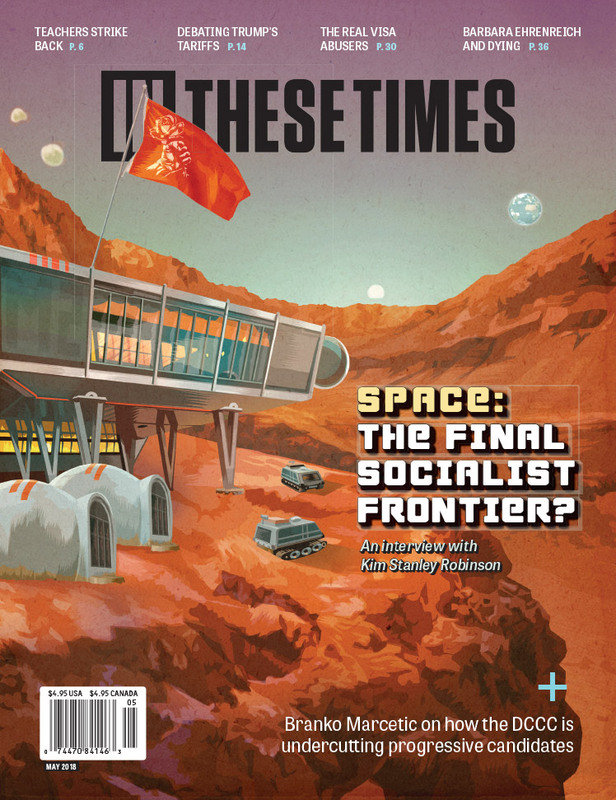 In the 2015 Jacobin piece “Democratize the Universe,” Nick Levine argues that a collectively owned space mining industry could be a tool for wealth redistribution, while avoiding the harms of mining Earth. The late Stephen Hawking, a vocal progressive, suggested that humans must leave the nest if we want to survive climate change. For the layperson, it’s hard enough to know whether these futuristic visions are even plausible. Parsing the political implications feels out of our wheelhouse. The next century has arrived, and the colonists are getting their plans in order. 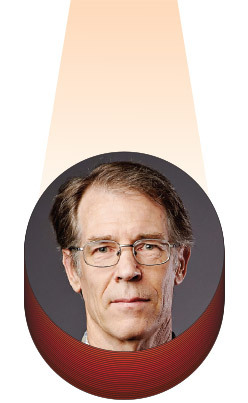 In These Times spoke with Robinson about Mars, our own fragile planet and his hopes for a robust space science program. In Red Mars, the first mission to settle Mars launches in 2026. SpaceX is hoping to send the first crewed mission to Mars before that. Did you expect the real world to move this quickly? I am surprised by the speed of SpaceX’s accomplishments. We needed a big booster like the Falcon Heavy, and I expect it will get put to good use—meaning not just SpaceX using it, but other entities doing interesting things like sending landers to the moon or to asteroids. But Elon Musk’s Mars plan is still a science fiction story, in the same way that grant proposals and fundraising pitches are science fiction stories. They’re set in the future, and they hope to bring that future into being by telling the story in advance. So as far as settling Mars, I didn’t have any expectations then, and I still don’t. All these projects are contingent on human decisions. The technical problems are only one aspect, and the other aspects, including funding, are unpredictable. Is there a danger to putting a billionaire in charge of space exploration? It’s a mistake to say a billionaire is in charge of space exploration. Landing people on Mars will require an actor network that includes Mars itself, the space between, the laws of physics and many parts of human civilization both public and private: scientists, workers, politicians and more. No one actor in this network can do it just because they have a passion for it. It would have to be done on the cheap, and this would create unacceptably high risks for the astronauts involved. Landing people on Mars is harder than many people seem to think; robot landers have only a 50 percent success rate, and human landers would be much harder. As the 2020s pass with nothing much happening in the Mars way, the difficulty will become more obvious. Although probably the stories will continue full speed ahead. Some on the Left suggest that putting resources into space takes away resources from the social good here at home. Do they have a point? No. Space science is an Earth science. Our current presence in space is all about science and communications. Communications satellites are a big part of our civilization right now, and mostly in a good way. Space science is important because we live on a planet that we are impacting in unexpected ways, so we need to know more about planets to help figure out what to do about that. A good example of this is when we found out we were creating a hole in our atmosphere’s ozone layer, and managed to stop creating that hole before we all died from it. How did we do that? By sending orbiters to Venus and Mars and studying their atmospheres. There are many other examples of this kind of useful knowledge, because comparative planetology is a real thing. Earth is a planet, and we depend completely on it for our existence. Now that we’re damaging it in very dangerous ways, we have to invent a sustainable relationship with it. In that project, space science is useful. It isn’t a cure-all, not even close, and should only be funded in proportion to its usefulness. But it is useful. At the recent SXSW festival, Elon Musk mentioned that having a reserve population in outer space—on the moon or on Mars—could be helpful in case World War III devastates humanity. Is this a viable solution? Or might the rich leave for space while the rest of us suffer? Billionaires moving to space is not just similar to a sci-fi plot—it is a sci-fi plot, and not very realistic. It has to be said: There is no Planet B. It’s here for us, or nowhere. But really, that is very obvious. Very few people actually believe that setting up a small settlement on Mars is an adequate safeguard or mitigation for the damage we are doing here on Earth. Those who do are fooling themselves. Mars and all the rest of outer space are spectacularly unsuited as another basket to put our eggs in. The rich can always just move to Malibu or Davos and hire guards. That’s the outer space being referred to. Will humans live off-planet in our lifetimes? If so, what will it look like—socialist utopia or mining camps? As efforts to return people to the moon intensify, I think Musk might get SpaceX involved with that project, which is achievable and affordable now. As for Mars, it will continue to be what we might call “the hardest place we might be able to get to,” thus an interesting technological challenge, but very expensive and time-consuming, and maybe not important enough to pursue anytime soon. When we do land on Mars (as with the moon), our bases there will probably resemble our current stations in Antarctica, at McMurdo and the South Pole. Scientists and support people will probably do a stint on Mars and then go home, which means around five years spent off Earth, doing science and loving life. That will be great when it happens—much closer to socialist utopia than mining camp! After that’s gone on for a few years, most people on Earth will probably pay about as much attention to Mars as they do to the base now at the South Pole—which is to say, none. If you doubt this, think about the later Apollo missions. Or the people on the space station right now. So how should progressives think about SpaceX? They should be grateful that at least one billionaire is interested in space science. Actually there’s more than one. But I think it’s legitimate to go further and ask, “Why are there people as rich as this anyway?” Why aren’t there progressive taxes on both income and capital assets, as economist Thomas Piketty suggested, such that the richest people max out at a certain nicely high number, beyond which wealth is passed through to the collective that made it? People and corporations could be taxed at the high rates we had under the Eisenhower Administration, for instance, with perhaps the additional perk that individuals could choose which government programs some portion of their taxes would go to—a kind of direct democracy support for the different functions of government. If the various agencies’ funding was partly a matter of popular “vote by taxes,” rather than entirely the result of Congress’ corrupted appropriation process, then it would be interesting to see how much money NASA ended up with, as well as the National Science Foundation (NSF), National Institutes of Health (NIH) and so on. If you were president, would your budget proposal put money toward these agencies? I would look at the relative worth of each agency and how much of a budget increase it could handle. My proposal would suggest that NASA be funded at about $100 billion a year (currently it’s $20 billion), taken out of the Pentagon budget (currently $770 billion a year), because many of the same industries support and are supported by both agencies. I’d fund NSF at $200 billion a year (currently $7 billion), and the Department of Energy at $100 billion. NIH $200 billion a year. Then I’d let the scientists figure out how best to spend that money. They would have to scramble at first to find enough worthy projects—a good problem to have. Putting humans on Mars would be low on my list. Our robots are doing fine there. I’d like to see robotic explorers sent to the moons of Jupiter and Saturn first. Your Mars trilogy gets into the ethics of colonizing Mars—some characters want to terraform it to fit human needs, others want to leave it in its original state. Colonization is not the right word here, signifying as it does imperialistic power relations between humans, or perhaps, at a stretch, between living beings. Space is lifeless, so when we settle out there it’s better to use the words inhabitation or settlement. It’s true that the lifelessness of Mars is less certain than it was when I was writing my trilogy. Mars was then widely assumed to be a dead rock. Questions concerning the ethics of terraforming in the book were somewhat esoteric, having to do with the intrinsic worth of rockscapes. Some of my characters felt strongly about this, but I thought on balance that terraforming Mars would be a good thing. Now, the possibility that there might be bacteria living under the Martian surface has been raised. There are pieces of Mars on Earth, and pieces of Earth on Mars, and some bacteria are so hardy that they might survive the transit between planets and remain deep under the Martian surface. Also, life began somewhere—it might only take heat, water and some minerals. So it might have begun in many places, maybe even everywhere all the required elements exist. So now governments and international treaties and the U.N. have put planetary protection protocols in place, and it’s a matter of intense debate as to whether we should even land on Mars, or on Jupiter’s Europa, or Saturn’s Enceladus, or on other planets and moons where there appears to be liquid water that could support bacterial life. Robotic landers on Mars are sterilized as much as possible, but they still have bacteria on their interior surfaces. People who want desperately to go to Mars don’t talk about this much. Places like the moon and the asteroids, and most bodies in the solar system, are almost certainly dead rocks. I think stations on these would be great. To pivot from Mars to Earth: In books like New York 2140 you’ve looked at how humanity might respond to climate change. When did that issue first get on your radar? In the process of researching my Mars trilogy through the late 1970s and 1980s, I became more and more aware of the accelerated climate change humans were causing by burning carbon into the atmosphere. When I went to Antarctica in 1995, all the scientists down there were talking about it, and many of them were studying it. Almost everything I’ve written since then has taken climate change on Earth as an unavoidable civilizational challenge. I’m not that surprised by our relative lack of action. It’s hard to change habits, and our carbon-burning technological base is massive and creates certain path dependencies. So change can be slow. But it can be fast, too, and since 2004 we’ve seen a huge rise in awareness of this problem. It’s now the central issue of our time, and dealing with it will change human history, because it will take inventing a post-capitalist political-economic order to cope successfully. The Paris Accord was a huge thing, of world historical importance—by which I mean, if there are people thousands of years from now writing a world history, the Paris Accord will get a mention. The Accord only gets us halfway there, but the first half is important, and would create momentum. Of course, the Paris Accord is only an agreement, with no good enforcement mechanism. There are worse forces than Trump conspiring to undo or ignore it, and to continue to burn fossil fuels and cast us heedlessly and irrevocably into a mass extinction event that will hammer humanity. This is the big battle of our time. So I think it’s very important that all progressives fully understand that in this context, science itself is a leftism, in that it pushes for social justice and sustainability practices. But science, like all other leftisms, can be bought by capital or defeated in political battle. We progressives have to recognize our allies in this battle and band together with them. approach climate and other green issues? Leftists and environmentalists are close allies in the same cause. There is no contradiction between the two: They both are or should be anti-capitalist. Environmentalism is not anti-human, as some leftists have maintained. Humanity is enmeshed with the larger biosphere so completely that taking care of the environment is taking care of our extended body. How can science fiction help us confront these issues? Literature is where we find or create the meaning of life. And science fiction is just the future-oriented wing of literature. That’s another very ancient exercise of the human mind, that imagining of the future. Prophecy, planning: any time we think about the future we’re doing science fiction. Dayton Martindale is an assistant editor at In These Times. He has a degree in astrophysical sciences.